Global Food & Beverages Color Fixing Agents Market size was more than USD 2.4 billion in 2018 and will witness 4.4% CAGR during the forecast timespan. Rapidly growing meat industry across the globe shall fuel the food & beverages color fixing agents demand over the forecast period. For instance, according to the Food and Agriculture Organization (FAO) global meat production in 2015 was 323,697 thousand tons and it is reached to 335,385 thousand tons in 2018. This escalating in the meat production & consumption shall occupy the major chunk of product demand in next few years. Food & beverages color fixing agents in meat are used to provide color, taste and protect against microorganisms. In addition, increasing demand for salt and cured meat will fuel the food & beverages color fixing agents demand during the forecast period. Additionally, meat was the major application segment in 2018 and projected to remain the largest over the forecast period. Food & beverages color fixing agents are widely used in beverages manufacturing such as alcoholic and non-alcoholic drinks owing to its antioxidant and antibacterial properties. Global beverages industry is forecast to grow with a prominent CAGR in near future. Increasing population and disposable income in emerging economies is likely to boost beverages market growth in coming years. This growth in beverages industry shall propel the food & beverages color fixing agents market growth during the forecast period. However, hazards associated with the food & beverages color fixing agents usage are likely to hamper its demand over the forecast timespan. Due to its hazardous nature, regulating authorities such as FDA are imposing stringent regulations on product applications in food, which is likely to restrict the food & beverages color fixing agents market growth over the forecast period. According to FDA’s regulation no. 21 CFR 172.175 food & beverages color fixing agents usage in smoked cured fish should not be more than 0.001% in the finished product. 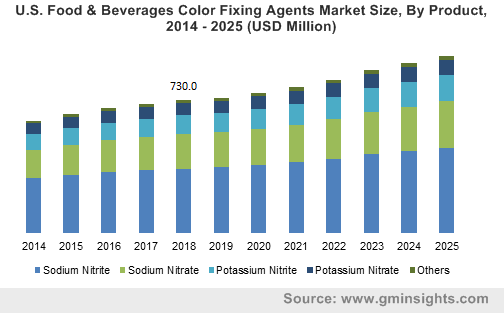 Sodium nitrite was the major product segment in food & beverages color fixing agents market in 2018 and generated revenue over USD 1.1 billion in the same year. It is widely used in meat and poultry & fish due to aforementioned product properties. Increasing consumption of preserved meat is driving the sodium nitrite market growth from past several years and projected to remain the largest application segment for sodium nitrite-based food & beverages color fixing agents during the forecast period. Potassium nitrite product segment is projected to grow with a highest CAGR during the forecast period. This can be attributed to the increasing product demand in meat and dairy application segments. Potassium nitrate is used in these application segments to maintain the desirable color of meats and hard cheeses. In addition, potassium nitrite based food & beverages color fixing agents is useful to cure & preserve meats against microbial agents such as clostridium botulinum. Meat secured the largest market share in food & beverages color fixing agents market and contributed close to 35% of the overall demand in 2018. Product demand in meat is forecast to grow with a highest CAGR during the forecast timespan due to the increasing meat consumption in Asia Pacific from past few years. Besides, increasing health awareness and disposable income in the region will boost demand for package food, thereby, positively driving the industry in the coming years. Meat consumption in the emerging economies such as China, Brazil and India increasing with a more than 6% CAGR and forecast to with a prominent number during the forecast period. Dairy was the one of the prominent product application segments in 2018 and anticipated to grow with a healthy CAGR in next few years. Food & beverages color fixing agents in dairy industry are used to maintain the desirable color and increase product shelf life. Asia Pacific shall experience above average industry gains of 4.7% CAGR during the forecast timespan both in terms of volume and revenue. This can be attributed to the increasing meat and dairy products consumption in the region. In addition, Asia Pacific is the largest fish market globally and projected to remain the largest over the forecast period. Increasing fish exports from the region will drive the food & beverages color fixing agents market during the forecast period. Rise in consumer awareness about healthy nutrition is expected to boost the global seafood market growth over the forecast timespan. North America has registered highest share in food & beverages color fixing agents market in 2018 with revenue generation close to USD 850 million. High consumption of beverages and preserved meat were the major attributes for such massive industry share over the past few years. 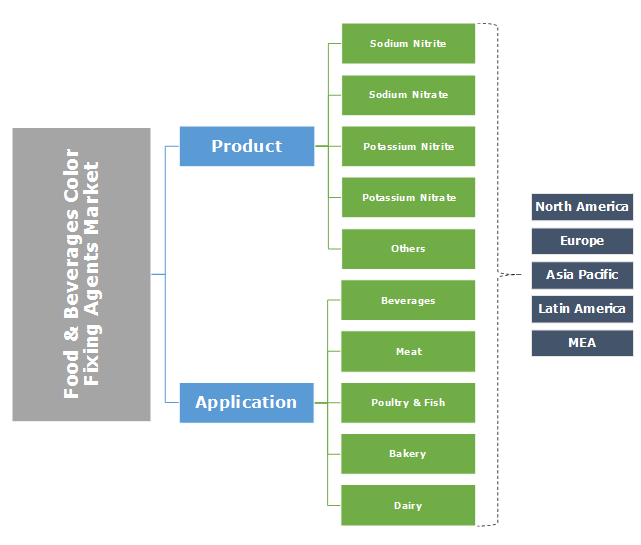 Food & beverages color fixing agents market is diversified, many multinational and local vendors operating in the market. This can be attributed to the increasing product demand across various application segments. Some major players operating in the industry includes, America Elements, Naturex, BASF SE, Aldon Corporation, GFS Chemicals Inc, Merck KGaA, Mitsubishi Chemical Corporation, Spectrum Chemicals, AkzoNobel NV, Old Bridge Chemicals, Sonac, Yara International and Airedale Chemicals. Major global players operating in the industry are working with local vendor and distributors to increase their customer base. For instance, BASF SE in Austria selected Häffner GmbH & Co. KG as its local distribution and marketing partner for sodium nitrite and sodium nitrate food & beverages color fixing agents. Food & beverages color fixing agents hold the existing natural color. They sustain real essence of food and protect it from losing its inherent color. Many food tastes bland due to the loss of color owing to which food & beverages color fixing agents are gaining importance from past few years on account of increasing penetration of processed and packaged food. It helps in fixing the natural tone of food even when cooked. Majorly used color fixing agents includes sodium nitrite, sodium nitrate, potassium nitrite and potassium nitrate. Major product application segments in the food & beverage industry includes processed food, meat, beverages, bakery, etc. It is highly used in processed meat to preserve the taste and stabilize its color. Increasing demand for processed food will propel the food & beverages color fixing agents demand over the forecast period.